Get a step-by-step guide to healing mind, body, and spirit during the first months postpartum. Dr. Jolene Brighten delivers easy to digest natural techniques, plus more than 30 herbal and nutritional recipes to support healing and the transition into motherhood. Get it now for just $14.95! 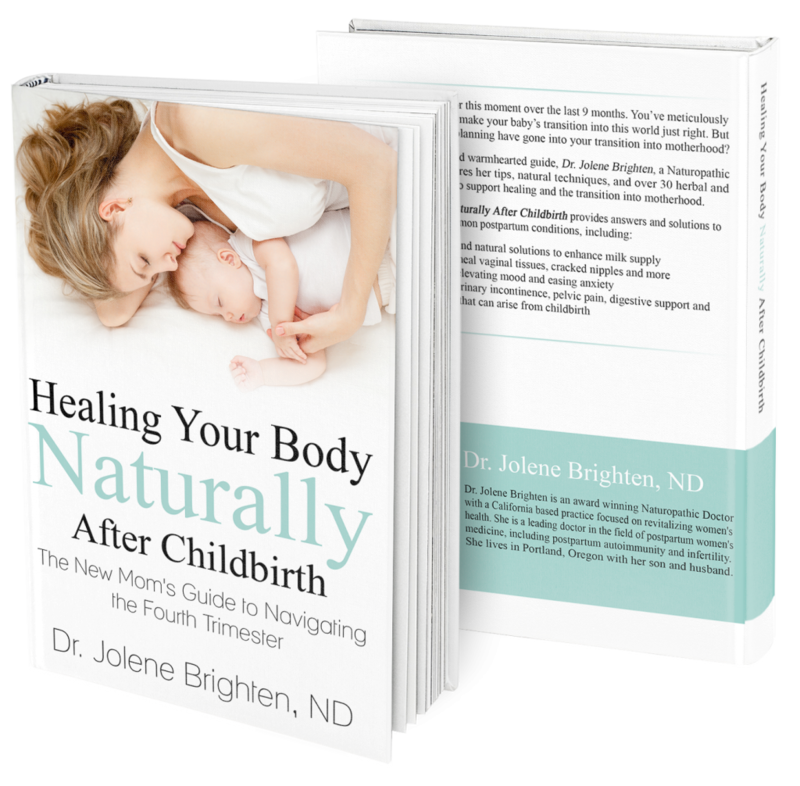 Dr. Jolene Brighten has written the most comprehensive and important book for mother's to read after childbirth. The book is filled with practical and effective strategies to help all new mother's navigate themselves back to health. Childbirth can be a trigger for many health problems and this is book is a critical read for all mother's after the birth of their child. - Datis Kharrazian, DHSc, DC, FACN, CNS, Associate Clinical Professor Loma Linda University School of Medicine, Department of Preventive Medicine, Author "Why Do I Still Have Thyroid Symptoms When My Lab Tests are Normal?" and "Why Isn't My Brain Working?" Amazing!! Dr. Jolene Brighten pours her heart and soul into her new book, Healing Your Body Naturally After Childbirth, delivering practical tips and remedies. She spends time explaining what happens to a woman's body after child birth and guides you through a step by step process to healing. From using tinctures, to essential oils, to giving nourishing recipes, to self-care tips, she's got you covered. I love how she covers autoimmune thyroid and adrenal issues as well. Personally, I do not have any children, but I have struggled with my thyroid and adrenals for years, and I LOVED the valuable information and knowledge Dr. Brighten has shared. I have been working with Dr. Brighten for several months to help with my hormones, thyroid, and adrenals and I love her natural approach to healing. She is also a real food advocate and includes some wonderful food tips and recipes that I will be implementing and making, like her Turmeric Ginger Tea and a variety of yummy smoothies. Every recipe includes purposeful superfood ingredients and are extremely nutrient dense. Don't take my word for it, get your copy today and enjoy the wealth of knowledge that Dr. Brighten shares in this book! "Healing Your Body Naturally After Childbirth" is the definitive postpartum guide. I desperately wish this book had been around after my son had been born 7 years ago. Having this book as a resource would've saved me years of postpartum suffering and hours at the doctor's office. I love all the resources, recipes and real life experiences that Dr. Jolene Brighten included in this book...perfect for pregnant and postpartum mothers...even moms several years postpartum. I still learned some things that could be beneficial to me now! And after reading this book, told my sister who is 4 weeks PP to order it right away. Had I had this book after the baby was born, I could have addressed so many symptoms effectively and naturally and likely would have caught my Hashimoto's thyroiditis diagnosis much sooner. If you know or love someone who is pregnant or has recently had a baby, get this book for them! They'll adore you for it - such a thorough and practical resource. My job consists of finding the best doctors and practitioners I can find to share their knowledge, experience, and expertise with our audience via webinars, interviews, articles, podcasts, etc… Dr. Jolene Brighten has been, hands down, one of the brightest stars we’ve come across. The information she shares, much of which is found within this book, is second-to-none among all the doctors, practitioners, and other professionals I’ve been lucky enough to work with in some capacity. I can’t possibly recommend this book highly enough to do it fair justice. To anyone out there thinking about having a baby, currently pregnant, or recently having given birth – this is an ABSOLUTE must read. Dr. Brighten’s vast level of knowledge is matched only by her completely genuine care and good intention for those people who she’s able to reach with her message. The book is easy-to-read, easy-to-follow, and written in a way that makes some potentially intimidating topics approachable for everyone. Dr. Brighten has an amazing ability to take extremely complex information and explain it in a way that makes simple sense! This book is a perfect demonstration of that rare gift! 10 out of 10 in my book! While many books on the market focus on having a healthy pregnancy, very few give us insight into how to recover our health after pregnancy. Pregnancy and childbirth can trigger a host of health issues, including postpartum depression, and even new onset autoimmunity. 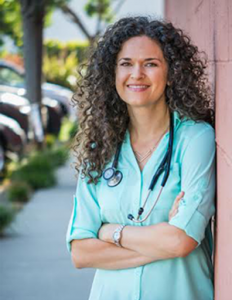 After her own struggle with postpartum autoimmune thyroid disease, Dr. Jolene Brighten was forced to take charge of her own healing, using her training as a naturopathic doctor to recover her health. Since that time, Dr. Brighten has dedicated her life’s work to empowering women in the “fourth trimester” and she shares the very strategies she has used to recover her own health, as well as the health of the many women who have trusted her with their care, in her new book “Healing Your Body Naturally After Childbirth: The New Mom's Guide to Navigating the Fourth Trimester”. This book is the definitive guide on recovering your health after pregnancy! If you found that your health problems started after pregnancy, it’s not too late- the recommendations in this book can still help you and change your life and health for the better. If you are pregnant or thinking about becoming pregnant, please get this book ASAP-it may just save your life and your future children's lives! This little book is A MUST for women approaching childbirth. Whether you plan to birth at home, at a birthing center, or a hospital - and whether you plan a natural or cesarean birth - this book is an excellent guide for the postpartum mother. It is absolutely FULL of recipes, remedies, and trouble-shooting that any mom can follow. Written in a concise, friendly, and highly-readable tone, Dr. Brighten gives the facts "straight-up" on everything from breastfeeding to vaginal tearing. She even touches on the rising practice of placenta encapsulation (a therapy that is nothing short of amazing for relieving postpartum depression and rebuilding mama's blood and vitality post-birth). As one of the leading experts in the nation on thyroid hormones, Hashimoto's, and pregnancy, Dr. Brighten goes the extra mile to include information on how to approach treatment of thyroid issues postpartum - information that simply cannot be found elsewhere. I will be recommending this quick and wonderful read to ALL my patients who come to me to treat their infertility. In fact, I wish I had this gem when I gave birth to my own daughter! Fantastic work, Dr. Brighten! If you're pregnant or in the postpartum period, you need this book. This easy-to-read guide helps you navigate the postpartum period in a way that hasn't been done before. Dr. Brighten provides invaluable information on how to naturally troubleshoot common postpartum concerns through her natural action plans. My favorite part is that she doesn't pass judgement on choices that you make during and after your pregnancy. She just provides the support you need while holding your hand through it all. As a registered dietitian specializing in postpartum health, this is the book I recommend to all of my clients. Natural remedies to holistic therapies to sound advice for taking care of your body after baby is a must-have for every new mom. Dr. Brighten also gives fantastic advice for taking care of your thyroid and getting your hormones back in a balance (something most doctors don't pay much attention to). Every expectant mother needs this book! Dr. Brighten's approach to natural healing after childbirth is a godsend for new mother's! She offers a wealth of excellent and sound information that I don't want my clients to miss. So many women are diligent about taking care of their bodies during pregnancy, but there isn’t much focus on mothers’ health after baby is born. Unfortunately, for many women, this can be a time of great struggle, as bodies begin to heal from the marathon of pregnancy and childbirth and they begin to deal with the stressors of little sleep and even less self-care. Dr. Brighten combines years of clinical experience, leading edge research, and her own postpartum journey to bring you this comprehensive guide that includes recipes and bite-sized techniques that are easily implemented, even in the first days after birth. 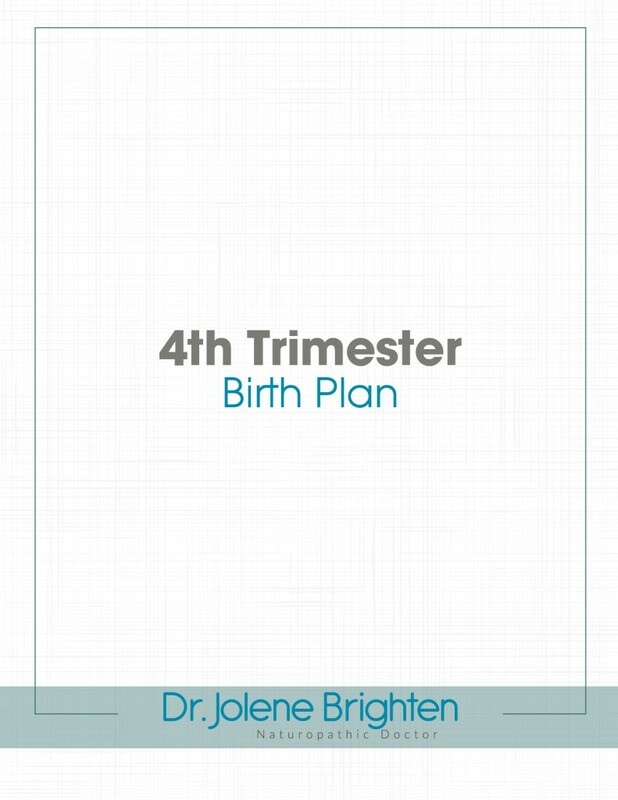 Grab a copy of my FREE 4th Trimester Birth Plan! Preparing yourself for the 4th trimester is just as important as preparing for the birth of your child. Use this tool to make sure you're ready to go! Buy it now for just $14.95!